Confederates, Southern Unionists, and… The Waltons?! To be clear… I’ve always been a fan of the Waltons… though I prefer the first three seasons over the rest. While the Waltons are a fictional family, and their story is based on the artistic skills (though some are based on real-life contact with people from the area) of writers (and, Earl Hamner, Jr. wasn’t the only writer, by the way, to contribute to the long list of episodes) and directors , the show did a pretty good job at offering glimpses at the culture found in some of the people in this area… even to the point of offering a glimpse at the complexities found in sentiments among people here, when it came to the Civil War. As each show reached back into the past, to a time in which Civil War veterans and their widows were still around, it seemed only a matter of time where the “Walton memory” would intersect with “Civil War memory”. 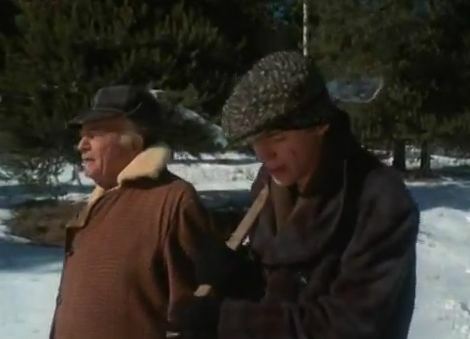 Indeed, it seems we may have had a brush with it as early as the television premier, on December 19, 1971, in The Homecoming: A Christmas Story, when we hear about Walton’s Mountain being “fought for land”. While talk of “wars”, in the combat sense, stirs the heart of a youthful John Boy, Zeb Walton puts greater emphasis on the “battles” (since the fictional family came to the mountain, in the 1780s) found in the daily lives of a Virginia family in the back country, very much setting the tempo for the entire series. Still, like John Boy, I seem to recall remaining on the edge of my seat, waiting for the hat to drop on stories of the family in wars that predated John, Sr. & Ben Walton in WW1, and Zeb Walton in the Span-Am War. Finally, in season three’s “The Conflict” (episode #51), it happened. When we first see Martha Corrine Tyler Walton, we begin to hear about the Walton family in the Civil War… specifically, Martha’s husband, Henry (Zeb’s oldest brother). Martha recalled that Henry enlisted with Stonewall Jackson, and later, after Jackson’s death at Chancellorsville (the location being used in a “relative” sense… and not bad for the show to adhere to history), fought under Jubal Early. Two years later he returned from the war (despite Martha’s concerns, having heard about Gen. Custer hanging Confederates… more kudos to the writers for adhering to local history). Good stuff (and it may have been critical in starting me down the road looking for my ancestors in gray). Not only that, but you can’t feel a tinge of that “defending hearth and home” spirit, when you watch as government officials seek to remove Martha Corinne and her family from their mountain home (a different topic of discussion, but ask me sometime, if you’re curious, about what they call the “mean streak that runs down Rt. 340”). 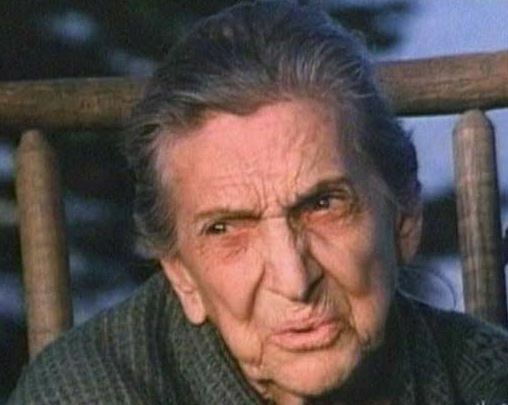 Beulah Bondi in her incredibly well-done portrayal of "Martha Corinne Tyler Walton"
Surely, that’s not the end-all game when it comes to the Walton family… after all, one Confederate does not define the family. Of course, we really don’t know anything else about the Walton family, under arms (or, in any way, in support of the Confederacy), in the Civil War. Granted, once again, this is a fictional family… but… I have to say, this doesn’t sound much different than in the case of real people, in this area, knowing (for the most part) so little about their families in the war. Usually, at best, we are left with little more than tidbits… and not always do they tell of the families limited in their sentiments. It’s a sidebar to the big story behind the movie, but, in the midst of planning for his wedding, John Boy goes back to Walton’s Mountain, “to reunite with his Grandmother and fill in some gaps” regarding Grandma’s story. 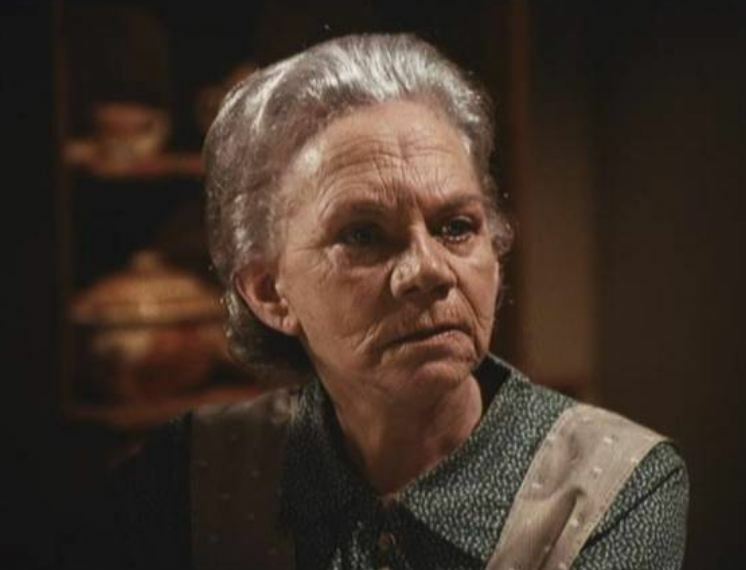 Ellen Corby as Grandma Walton... and I have to say, in her, I saw something familiar in personality... reflective of both my grandmother and great grandmother. He tries to research her ancestry, but finds no mention of her father in any of the family papers or Bible. When he finally asks her about him, she becomes very agitated. Further research into letters held by the Baldwin sisters (who have a story of their own to tell regarding possible Unionism in their father… or, as they would prefer… maybe not… see below), reveal that, although Grandma’s father lived in the South, he sympathized with the plight of the slaves and joined the Union to fight against slavery. His neighbors called him a traitor and his family was shamed. Nothing at all to be ashamed of, really… and John Boy points that out. Despite the show being centered on a fictional family, it reveals something in our past, among our people, here in the shadow of the Blue Ridge. While some of us might embrace the series for its family values, and family-friendly programing, perhaps we might also take to heart the messages of diversity that it offers. Just a thought. Oh, and regarding the Baldwin sisters (who, by the way, were members of both the D.A.R. 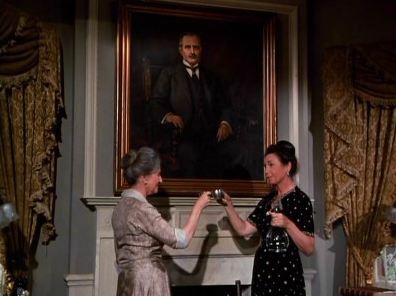 and the Daughters of the Confederacy)… take a look at the show titled “The Boondoggle” (4th season, episode #5/overall episode #80), in which the ladies deal with the story of their father in the war. A captain in the Confederate army, and cited personally by Gen. Lee, Judge Baldwin was also charged with treason against the Confederacy, for harboring Union soldiers (he aided soldiers from both sides following the fictional “Battle of Rockfish Gap”). Again… sure, the show is fictional… but, when we take time to look more carefully at the history of this place… our history here… I believe it reveals the complex realities of truth… all worth taking the time to consider and embrace. ← What historical period dominates the (interpretive) landscape, and which are sorely absent? This is perhaps the best history in popular cultural analysis I have seen in quite sometime. Having been both a media professional and a history teacher, I can say the vast majority of people’s impressions with many aspects of history are based on popular themes rather than scholarly references. I’ve been watching this show in reruns lately and am again reminded of why this was such an excellent series, but I now have a new appreciation for it in light of this commentary and my own study of the era in recent years. Thanks again for a well-written piece. Thanks much for your positive feedback, Greg. I feel fairly certain that more posts will be coming up, based on some of the other points I brought up about the series and the Depression Era. In many ways, between the series, and my time viewing it, often with my grandparents (born in 1903), it serves as a personal “bridge across time”. Again, more to come on that “bridge”. Really interesting analysis. I remember watching the Waltons as a kid, but I don’t remember if I liked it. It seemed like the Waltons and Little House on the Prairie were popular re-runs in my youth. Still, that is an outstanding post and a very good read. I really enjoyed it. Thanks, Richard. Glad you enjoyed it, and commented. Of course, I now see that it aired from 1972-1981, so I guess they weren’t re-runs I was watching.after all.